NiceHash is an interesting and relatively new service that allows users to sell the hashrate that their mining hardware generates or to buy such to mine a specific coin at a user set pool with one of the supported crypto algorithms. This service however is not a mining rig leasing or cloud mining from a centralized service provider, it is more like something in between these two and the result you get is actually pretty nice as an alternative to the other two services. We have tried the service for both selling some hashrate ourselves as well as buying some to see how are thing and to also get a good idea on how well it operates for both buyers and sellers. We are also going to share some useful tips that we have discovered during our testing of the service, so that you might get a better start should you decide to check it out yourself. The first impression when you open the website of NiceHash can be a bit misleading if you are not sure what to expect, so we do recommend to start with the FAQ section of the website to learn about the service and how it operates in order to get to know how things work. The FAQ section should give you most of the answers you might have, and you should also check the page with information about compatible software miners with the service and make sure you are using one of the recommended miners in order to avoid possible problems. In short what NiceHash does for you is act as a stratum proxy between you and the pool that your hardware is mining at for the moment. So all you have to do is to set the right stratum server for NiceHash in your miner, depending on the algorithm that the miner uses and just run the miner as usual with your Bitcoin address as a username and enter any password. It is as simple as that and you don’t even need to register in order to be able to sell your hashrate, though for buying hashrate you will have to make an account, because you will be depositing Bitcoins that you will use for purchase. Currently NiceHash supports Scrypt, SHA-256, Scrypt-Adaptive-Nfactor and X11 algorithms and you can purchase hahsrate and point it at the pool you want to mine at if you are buying hashrate. All purchases and payments are made in Bitcoins, no other crypto currency is currently supported by the service. So you can say that when selling your hashrate it is almost as if you are mining in a multipool where regardless of what is being mined you get payed in Bitcoins in the end. Now, we have started with the buying part where we have decided to get some X11 hashrate as DarkCoin is currently booming, so the interest in X11 hashrate is high at the moment. 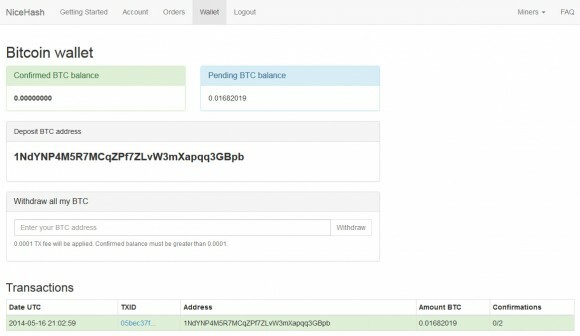 We have started with depositing a small amount of Bitcoins to our wallet address in NiceHash and we quickly got the deposit available as only two confirmations are required for you to be able to use the deposited Bitcoins for orders. Again, in order to be able to buy hashrate you will need to register as the procedure is a bit more complex and can be even a bit confusing the first time you go through the whole process, but after that it is easier as you know what to do and how. The page where you create an order is the hardest to go through the first time, especially if you haven’t familiarized yourself with the way the service operates and checked how things work with the orders. 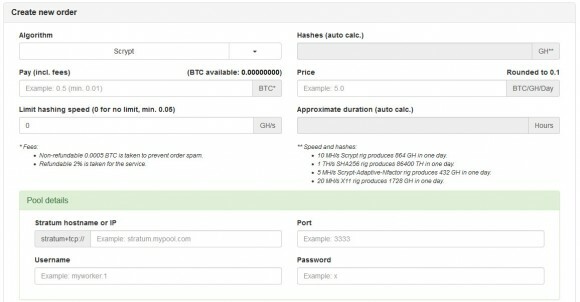 Here you need to select the algorithm you are going to be purchasing hashrate for, then select how much you are going to pay (you need to have the Bitcoins already deposited and confirmed), the minimum you cans pend for an order is 1 Bitcoin cent (0.01 BTC). You can select to limit the maximum hashrate you are getting per second, something that is a good idea actually, but we’ll get back to that in a moment. And then you also need to set the price you are willing to pay in Bitcoins per Gigahash per Day, you can find the current rates for the different algorithms on the front page. Calculating this can be a bit confusing, and you need to be careful and watch how the market price is moving with the currently available orders. Based on your settings you will get an estimation for the total hashrate you will get and the duration you will have the purchased hashrate mine for you. Do note that the service charges 2% fee on the purchase of mining hashrate. After that you need to enter the pool details, make sure you are setting the right pool that uses the algorithm you are purchasing hashrate for and also make sure to use pools that are working stable and can handle a lot of hashrate coming to them. If you do not limit the hashrate you are going to be getting and you have the highest price you ma end up throwing an enormously high hashrate at the pool of your choice and thus you may bring it down if it cannot handle the load. This is one of the reasons you need to use some sort of a limit to the hahsrate you are going to be using, regardless of the total amount you purchase. One of the nicest things about NiceHash is that you can purchase 1 GHS worth of X11 hashrate for example and have that mining for you for 10 minutes, 60 minutes, a day or more… it all depends on the total amount you are spending and the limit (if any) you have set. So you can purchase ridiculously high hashrate for short period of time and get it right away instead of purchasing just a few megahashes that will mine for you for months – the end result should be similar. The first option of getting a lot of hashrate for shorter time does have some more advantages however as yo do not have to worry about difficulty increase as much as when mining for longer time, but it also has drawbacks. You must always set limits in the hashrate if you are mining for crypto currencies such as Bitcoin or DarkCoin that do have pretty high difficulty and finding block make take up to 30 minutes, an hour or even more. The reason for that is to have the hashrate mine for you for long as if you get some bad luck and the block finding time is over the average your mining profit may be less if you throw a lot of hashrate for just a few minutes. Spreading the hashrate with a limit for longer time would cover better for bad luck at the pool and will also minimize the risk of you bringing the pool down, so do consider setting the limit for hashing speed. 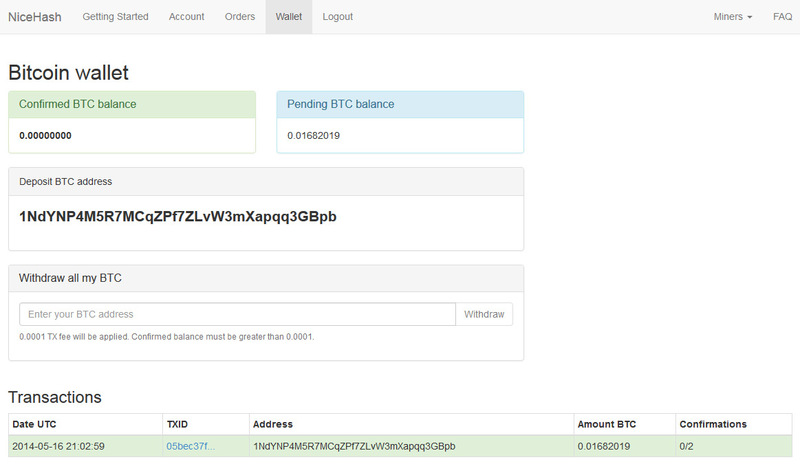 When you activate an order you can see the progress and you can also edit some of the parameters or cancel the order before it is fully executed and get back the remaining Bitcoins that are still not spent. What you can edit here is the price you are paying for GH per Day, though there is a catch here and it is that you can only increase the price, not get it lower than your initial offer. This is a plus for the people selling hashrate, but not so good for maximizing efficiency for people buying hashrate, though you can cancel the order and recreate it with lower price if suddenly the market price for the hashrate drops significantly under your set price. The other thing you can change on the fly is the limit of the hashrate you have set, or if you haven’t set one you can add it here. Changing both settings may take a bit before they are activated and if you are changing the limit significantly it may also take a bit longer before the active hashrate adjusts to the new value. You can also track your order in the list of orders on the homepage, your active orders are marked with blue, so they are easy to spot and keep track of. This is the place where you can track the current market price and especially if you do not want to rent all of the available hashrate, but only some part of it there is no need to set the highest price, with a lower offer you can still get the amount of hashrate you need and as we’ve mentioned if the price increases you can also adjust it up or cancel the order and recreate it if the price gets lower. It is a wise idea to keep track of the market in order to really get the maximum for the Bitcoins you pay for renting hashrate and if needed do adjustments to your order. Also do check the expected return of investment based on the price you pay and the hashrate you get and if the market price goes too high then you can cancel your order and wait for the price to drop before reactivating the order as in the end you want to end up with more than you have spent. In our test we have spent 0.01682019 BTC for renting X11 hashrate at 1.1 BTC per GH per Day and the resulting mined DarkCoins wih the rented hashrate was a little over 1.2 DRK which converted on the DRK/BTC exchange rate was 0.01595322 BTC. We could’ve made a bit more if we have spread our hashrate for longer period of time with a lower limit than and we’ve started without a limit at first, so initially we got about 1 GHS worth of hashrate thrown at the pool and it was able to handle it. Again we advice to use a limit and not set the limit too high, even better start with a small limit and adjust it based on the results you are getting. Once you make a few orders you will get better, so do the first ones with a small amount so that if you mess up the order parameters the loss will be small in the worst case scenario. Moving on to the renting part, we have decided to test out renting a single GeForce GTX 780 Ti video card that produces about 4.6 MHS for mining X11 crypto coins such as DarkCoin. Do note however that it is not that wise to rent Nvidia GPUs for X11 hashrate as you need to use ccminer and it currently does not support backup pools, so if NiceHash is not providing work for you the card cannot switch to a backup pool and will stay idle and this is something that you do not want. Still this may not happen if you keep selling your hashrate, unless you decide to set a minimum for the price you are going to be selling your hashrate. Normally, unless there are no orders left your hashrate will be sold, though it might not be at the highest market order for the moment – this is something you can keep track in the status page for your account. Since selling of hashrate does not require you to register at NiceHash you need to find your status page by looking for your username which is also the Bitcoic payment address that you have set at the software miner. Do note that the service applies 2% fee for renting hashrate as well as for buying it, you will notice the subtraction of the fee when payment is processed. Also payments are made few times a day if your balance exceeds a certain minimum, different for each algorithm and you can read about them in the FAQ. 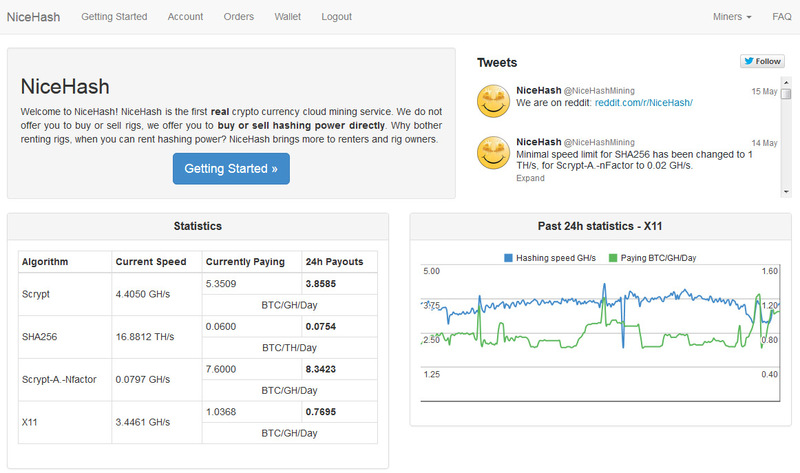 In our first 24 hours selling our hashrate of about 4.6 MHS we’ve managed to earn 0.00490318 BTC, so not so bad. 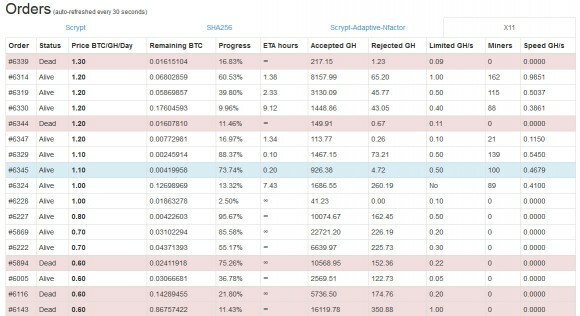 Do note that the market price was about 1.1 BTC when we started renting the hashrate and in the next 24 hours with the market price increasing to about 2.6 BTC at the end of the period we have earned 0.0079467 BTC or significantly better than for the first day. In fact if you want to make some good profit it may be wise to sell your X11 hashrate than to directly mine for DarkCoin for example as at the moment the interest is high and in the short term you can get more BTC than directly mining for DRK and exchanging them immediately after that or for using a multipool with direct BTC payout. Our conclusion, NiceHash is really a good alternative to multipools and cloud mining service providers or mining rig leases and if used right it can give you some nice profit, regardless if you buy hashrate or sell your hashrate. It provides you with a great opportunity to mine a lot of a new coin at launch time if you do not have a lot of hashing power yourself or to maximize the profit from the hashrate you currently own easier than to always look for new coins to throw your hashrate at. 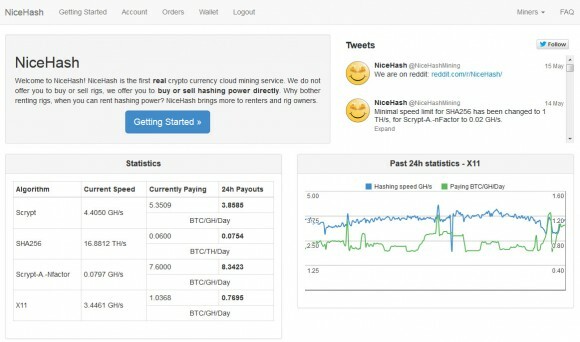 There are also some things that can still be improved, for example if you have registered to link your account to the selling hashrate functionality and thus be able to use the generated BTC from selling for buying hashrate as well should you wish to do so. 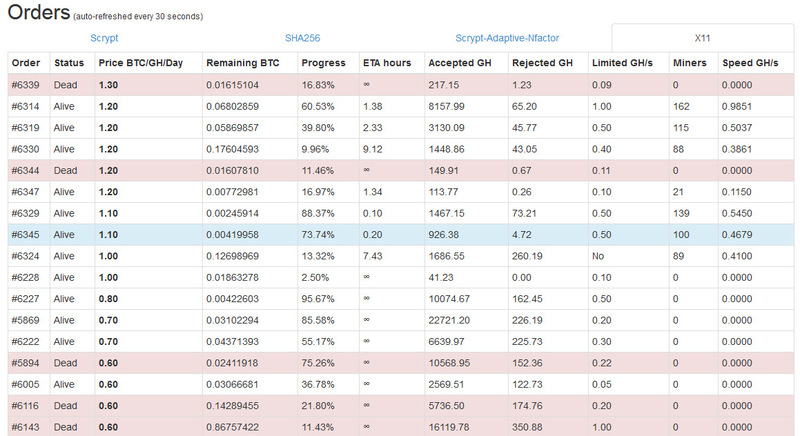 Generally however we’ve had no problems using NiceHash and we like how things are working out already. So if you still haven’t checked out the service we do recommend to do so now.